Tourism North East’s new brand pillar, Feast High Country, has launched its first social media campaign on Facebook and Instagram aimed at driving awareness of and engagement with the new feasthighcountry.com.au website by showcasing the people, places and products that draw foodies, wine connoisseurs, beer enthusiasts and flavour-seeking families to the region.  Feast High Country social channels are now highlighting the best content from the region by re-sharing high quality Instagram and FB posts that embrace the FHC story. Posts that use the @feasthighcountry and or #feasthighcountry tags can be considered for inclusion on the sites. 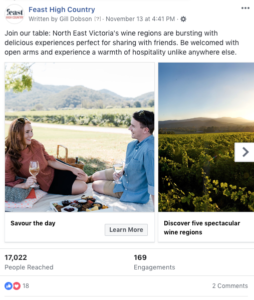 The social media strategy will also include paid content directed at the Greater Melbourne market, with a target of 1.2 million people engaged in food/drink/travel social media activity. TNE is encouraging tourism businesses to engage with Feast High Country social channels to stay connected with the latest food, wine, craft beer, spirits and produce stories and also to share High Country feasting moments by tagging @feasthighcountry and using the hashtag#feasthighcountry on Instagram and Facebook. The best FHC posts of the week will be showcased to an ever growing audience, hungry for delicious content and new experiences. Feast High Country will also be the new home of all the Feast High Country Festival (formally High Country Harvest) content. Stay tuned for news on the 2019 region-wide program, taking place across three weekends from Friday 3 to Sunday 19 May.